I read your book in a few hours and greatly enjoyed the information within. Your extra tips about chlorella and turmeric were very intersting. Your book is well written and informative for beginners and others on the path to better health. My teeth are really important to me, so when I saw a book by a dental hygienist, I went for it. It is so much more than that with advice and recipes I feel a friend is sharing with me. Easy to read and put in to practice. I would like to share my recent journey into plant based eating. Last Feb. I watched the DVD Forks Over Knives and my life was changed forever. The first thing I noticed was more energy. 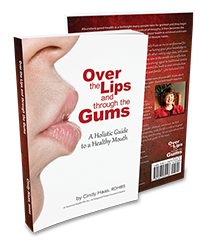 Cindy Haas is one a growing number of health professionals who has awoken from the myopic vision gifted by dental school training which regards the teeth, gums and mouth as being separate from the rest of the body.